Google is so last year, according to an analysis of the companies and projects most frequently mentioned in ministers' speeches. The internet company had topped the ranking put together by MHP, which counts the number of positive or neutral mentions, covering the period May 2011 to April 2012. But a year later it has sunk to seventh place as ministers moved the agenda on to infrastructure. HS2, Heathrow Airport and Crossrail are all in the top four, after the London 2012 Olympic and Paralympic Games, which was mentioned 103 times compared with Google’s previous table-topping 26 times. Strikingly, the controversial £43bn high-speed rail project went from being mentioned just once a year earlier to being mentioned 90 times during the period May 2012 to April 2013. The project was name-dropped by a range of departments amid questions over its suitability, according to Nick Laitner, acting head of public affairs at MHP. 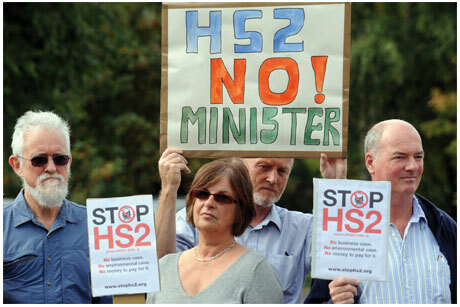 ‘HS2 is a flagship government project that is not without its opponents, so its high position in the table reflects the efforts of ministers fighting hard for the scheme, promoting its benefits and asking supporters to make themselves heard. Rolls-Royce was the highest-placed company and together with BT has featured in the top ten in all three years MHP has conducted the study, dubbed ‘Political Superbrands’. New entrants this year include Facebook, which was only mentioned three times last year, and the Fairtrade Foundation, which was not mentioned at all last year. The charity was held up by ministers as a good example of how consumers, producers, businesses, NGOs and governments can work together to help improve people’s lives. MHP also noted a considerable increase in the profile ministers have given to Tech City, the East London development zone the Government is encouraging. It was added to this year’s report and received 18 mentions. Google’s investment in Tech City helped it top last year’s report, as did an announcement about creating up to 350,000 UK jobs. However, the company received five fewer mentions this year, which MHP suggested might reflect the damage the corporation tax row has done to its brand. Critics of MHP's report might say that it does not provide a nuanced picture of ministerial support, but Laitner responded: ‘We’re not suggesting that this report gives is full picture of support from ministers; clearly this is only an indication on one measure, but we believe it’s an interesting one. This report is all about the brands that politicians choose to leverage when they are trying to make a point.